This is a licence of a patent to someone who will exploit it through sub licences. The licensor will take a cash payment or royalty, or both. Example: a patented device, part or sub-assembly which requires to be incorporated into a product for use. 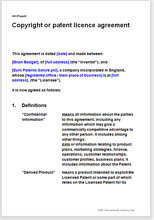 The essence of this patent licence agreement is that it is a licence by an inventor to a person or company who will market your patent for others to exploit in a given territory. The agreement can also be used for any other copyright work where you rely on sub-licences agreed and set up by someone else. You invent the gizmo. Your licensee sells it on by sub-licence to manufacturers. Your gizmo is likely to be something which cannot be used alone, but must be incorporated into another product. Examples: a switch mechanism; a ski binding; a diamond cutting blade; a tranquiliser dart. Use for any industry or purpose; home or abroad; for a period of time, or more likely, for ever; cash payment or royalty, or both. You can use this agreement for a one-off deal or for multiple agreements, each for a different territory. All Net Lawman documents are written to protect primarily the document buyer. However, we do not invite problems for you by ignoring the likely requirements of your counter-party. There are many provisions in this document which satisfy the concerns of a fair minded Licensee. Here is a list of the major subjects covered in this agreement.